Mr. Krabs: What better way to spend a afternoon than trolling the sea vent for spare change. (catches something on his magnet) Ooh! There's got to be a small fortune in discarded paperclips in there. (sand falls to reveal another magnet) I knew this place looked familiar. What's this? Goodness, that must be Sandy's treedome dwelling. And inside looks to be the largest soybean I've ever laid me eyestalks on. Now this bears getting a closer look. (rings Sandy's doorbell) Good afternoon, Ms. Sandy. Sandy: And good afternoon to you, Mr. Krabs. What brings you out to this find neck of the woods? Mr. Krabs: Well, I just happened to be in the neighborhood and was wondering if I could see you in clear and grace me with a comprehensive tour of your home sweet treedome. I hear the giant soybeans are lovely this time of year. Sandy: Sure. Let's get you fitted with a helmet. Mr. Krabs: Don't bother yourself. As long as I keep me ol' lungs moist, I can breathe your fancy air all day long. Sandy: Come on in, then. Mr. Krabs: It seems so much bigger once you're inside. Sandy: That's what they all say. Did I already show you my single-wheeled roller skate or my helicopter that is powered by coconut milk? Sandy: Or my artificial intelligence that comes in the form of a multi-colored cube-shaped puzzle. See? It can slove itself. Mr. Krabs: Sandy, actually I'm not interested in all of that. Sandy: Okay. Well, was there something particular you wanted to see? Mr. Krabs: Tell me about your giant soybean. Sandy: This is the result of an experimental growth serum I developed. It could easily feed a lot of hungry people. Mr. Krabs: Rich! I'll be rich! Sandy: What was that, Mr. Krabs? Mr. Krabs: Uhh... could I borrow your telephone? (dials the phone) It's ringing. SpongeBob: (runs inside) Mr. Krabs, I came as soon as I got the call. Mr. Krabs: Uh, did you bring a Krabby Patty like I was planning to ask you to do? Mr. Krabs: Perfect. Okay, Sandy. Administer the growth serum. Sandy: I don't know, Mr. Krabs. I can't predict what's going to happen. Mr. Krabs: Well you did say it needs futher testing. Test it on the Krabby Patty. Sandy: Well, I suppose so. But only a single drop. Mr. Krabs: Is it supposed to smell like that? Sandy: If you two will excuse me. I need to pay a visit to the little squirrel's room. Would you mind holding these while I'm gone? It'll only be a minute. Mr. Krabs: Oh no. We don't mind. (pours all of the growth serum on the Krabby Patty) There. Mr. Krabs: Shh, shh, shh! Thanks for the tour Sandy, see you later. Mr. Krabs: Great. Let's get it to the Krusty Krab! Mr. Krabs: Oh here, here. Put it in this grocery bag. SpongeBob: Grocery bag? Where'd you get it? Mr. Krabs: The grocery store. SpongeBob: So, uh, how big is this thing supposed to get? Mr. Krabs: (laughs) Who cares? It's an endless supply of free Krabby Patties. And cook them fast, boy. We got customers. Squidward: SpongeBob, are you going to cook that thing, or just stand there staring at it? SpongeBob: Sorry, Squidward. Coming right up! (gets some Krabby Patties from the large patty, and cooks them) Order up, Squidward! Squidward: Alright, keep them coming. SpongeBob: Oh my goodness! I almost forgot to flip that one. There we go. SpongeBob: Squidward, why did you make that weird noise- (looks behind, and screams as he sees the giant Krabby Patty. It starts to move) Easy boy. Easy. I never thought I'd say this, but I have to get out of this kitchen! (the giant patty swallows the grill) No! Huh? (the patty swallows his shoe. He tries to hit it with his spatula. It also gets swallowed. Screams and runs out of the kitchen) Squidward. That Krabby Patty is on a rampage! We have to escape! Squidward: Do you always go barefoot at work, or have I just never noticed this before? SpongeBob: Wouldn't this just count as half barefoot? Squidward, behind you! Abandon ship! Mr. Krabs: (to SpongeBob and Squidward) Hold it! And, just where is it you two think you're going? Squidward: The restaurant's being invaded by a 300 foot uncooked menu item. We're getting out of here. Mr. Krabs: Whoa. This is a dream come true. You can't just leave. Squidward: Oh, do you have a better idea? Mr. Krabs: Stay... and work. SpongeBob: Mr. Krabs, look out! Squidward: I think now's our break time, don't you? SpongeBob: Plankton, you're going the wrong way. Turn back or be crushed by a giant monster. Man #1: Keep running. It's getting closer. Man #2: Look. Where I'm pointing. It stopped. Man #1: Hey, he's right. SpongeBob: Gary! Gary, wake up! Pack your stuff. Our house is about to be knocked over by a giant Krabby Patty! SpongeBob: Wake up, Patrick. We've got to get out of here. Patrick: (wakes up) Oh, hi, SpongeBob. I just had the strangest dream. I was being chased by a giant Krabby Patty. Patrick: SpongeBob, what do we do? SpongeBob: We'll find Sandy. She'll know what to do. Patrick: I don't think she's home, SpongeBob. SpongeBob: She has to be. This is her treedome. Sandy, where are you? SpongeBob: (looks inside the toilet) Sandy? Sandy: No, SpongeBob. Up here! (appear inside helicopter) And hurry. I'm running out of coconut milk. SpongeBob: Whoa, what happened to your treedome? Sandy: Well that giant soybean got too big, so I chopped it up into a giant salad. Anyone got any giant croutons? Patrick: I think I'm going to be sick. SpongeBob: What's wrong, Patrick? Air sickness? Patrick: No. The thought of a salad that size is more than I can handle. Sandy: And now that I've mastered the soybean, I can master that patty. Sandy: The puzzle cube told me. The key to defeating the patty is you SpongeBob. All I have to do is get you closer to the patty so you can make direct contact. SpongeBob: Direct contact? Are you sure? Sandy: The puzzle cube never lies. (hovers over the giant patty) Alright, we have a visual. Putting you into position SpongeBob. SpongeBob: (climbs down the ladder) Okay, bye. Well, giant patty, I guess it's just you and me, now. Wait, what was I supposed to do again? Sandy: Just make direct contact. Sandy: It's working! Keep going. You can do it. 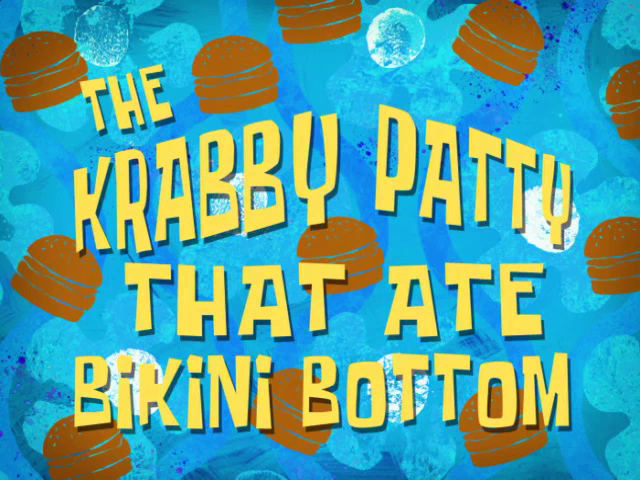 SpongeBob: Body filling with Krabby Patty. Enormous pain. Never absorbed this much Krabby Patty before. In fact, never absorbed any Krabby Patty into my body, come to think of it. (absorbs the entire Krabby Patty, and it spits out everything it swallowed) Okay, what do I do, now? Mr. Krabs: Step right up folks. For a limited time, preabsorbed Krabby Patties! Squidward: SpongeBob. Two. Medium rare. Mr. Krabs: That's it. Don't crowd. While supplies last. Don't be shy. Come on.